Recently an increasing number of whey proteins have been popping up showcasing the fact they only contain whey protein from ‘grass fed cows’. Such products carry the general assertion that their protein is of better quality and purity than traditional whey protein that come from cows that produce their milk via more conventional means such as a combination of grazing and indoor feed using feed concentrates and corn silages. It all makes for a nice sounding argument but what substance is there to back up such claims? Just because a given herd of cows predominantly graze on grass, does it mean they produce better quality protein once most of the fat, sugar, vitamins/minerals are removed during normal purification processes. Similarly, does increasing the amount of grazing increase levels of some of the key whey protein fractions such as b-lactoglobulin or even the total yield of whey? While there are proven benefits to organic-based outdoor grazing in terms of the nutritional quality of milk, it’s important to distinguish between these benefits and those that specifically relate to protein quality. For example, b-lactoglobulin is a major whey protein fraction that happens to contain the highest level of branched-chain amino acids of all the whey protein fractions. Therefore, if grass fed cows produced milk that had a higher b-lactoglobulin content, then this would be a definite advantage attributable to grass fed whey. To better equip readers to make an informed decision on whether they may benefit from a whey protein that is produced from grass fed cows, this article will provide an overview of the basic feeding and milk production practices used and their respective nutritional benefits. When trying to understand the health virtues of milk produced by different methods, it’s important to appreciate that there is seldom ever one specific method used to feed and milk cows, but rather a combination. Each of the above systems used a combination of feed concentrates and grazing, rather than one method alone. As expected, the outdoor organic system used the highest proportion of grazing or natural ‘grass feeding’. The table below shows the sample breakdown in percentage of feed between grazing and forage/concentrates. Data from the table show that grazing still makes up nearly 20% of dry matter intake or ‘feed’ in farms using conventional outdoor milk production systems, while it is just over 36% for organic-based systems. Naturally, indoor systems have a very low level of grazing. The data in this table comes from a selection of 20 farms from the North East of England. A similar study citing data from a total of 1,248 cow milk samples from 10 different EU countries showed that fresh herbage (aka fresh grass) made up to 65% of total dry intake matter2. Some readers may be surprised to see that grazing accounts for less than 40% of feed in organic systems of milk production and less than 65% in farms employing full grass feeding. However, this is due to the fact that most dairy farms have both outdoor and indoor seasons. During the colder months of the indoor season, cows are typically kept indoors and fed a high forage diet and sometimes food concentrates. As highlighted in the table above, cows are frequently also fed additional silage and concentrate together with restricted grazing, because of a seasonal lack of fresh herbage mass at pastures or the fundamental scarcity of pasture area for dairy farms11. Some farms provide occasional access to grazing during the indoor season (depending on climate) but it is mostly keep to a minimum. So the first point to note is that very few farms employ exclusive grass feeding - defined by 100% of dry intake matter. So what are the benefits of an increased proportion of grass feeding on the quality of milk produced by cows? As it turns out, there are numerous health benefits that are widely documented in the literature2. However, many relate to content of certain fatty acids, antioxidants and micronutrients; most of which are largely removed by the time milk is purified and processed for use in a whey protein supplement. Multiple studies have shown that as the proportion of grass feed is increased in the diet, there is a corresponding increase in milk content of polyunsaturated fatty acids, omega-3 fatty acids and a decreased proportion of saturated fatty acids3. More specifically, increasing the ratio of fresh grass to forage has been shown to increase the levels of conjugated linoleic acid. Other studies have shown that an organic model of milk production that employs high levels of grass feeding leads to higher levels of carotenoids (i.e. lutein, zeaxanthin, b-carotene & total carotenoids)1, 4-6. Outdoor-based dairy farms that rely on a high proportion of grass feed naturally allow for greater space for cows to roam than farms that employ low levels of grass feed and contain cows indoors. Numerous studies have confirmed that milk from cows in upper lying pastures produce different fatty acid profiles compared with cows grazing on lower lying pastures. Altitude is usually associated with more extensively managed pastures that are characterized by a lower regrowth potential7 and higher fiber proportion8. This in turn affects the nutrient profile of the grass and ultimately the nutritional quality of the cows’ milk. An increase in the amount of the essential omega-6 fatty acid linoleic acid is just one example of the documented characteristics of milk coming from upland grasslands2. The number of times cows are milked per day as well as whether automatic/robotic or manual milking methods are used is known to affect milk quality. For example, one study found increased fats in milk from udders that were milked 4 times daily compared with twice daily9. Yet another found increased milking frequency to decrease concentrations of both polyunsaturated fatty acids and total milk protein10. Additionally, it’s a known fact that use of robotic milking systems leads to increased cases of mastitis1. This inevitably affects the health of the cow negatively, which is not ultimately good for milk quality. The breed of cow can affect both milk protein yield and milk production. Perhaps the most well known example of the effect of cow breed on milk protein composition/quality is in the case of ‘A2 Milk’, with Guernsey cows said to be the preferred breed. There are however, a large number of cow breeds; some of which are Holstein-Friesian, Shorthorn, Ayrshire, Jersey, British Friesian, New Zealand Friesian and Meuse Rhine Issel. One of the few drawbacks with milk produced from cows fed a high proportion of grass feed is that it’s been shown to carry a higher concentrations of certain volatile organic compounds (VOCs)12. Also referred to collectively as terpenes, their levels in milk have been used as tracers of milk from highlands, where they typically occur in higher levels. The all important question when it comes to grass fed whey protein is whether it produces whey protein that has a superior protein composition/profile for the human body. As highlighted above, one way to achieve a better quality whey protein is by producing milk that contains a higher concentration of certain fractions such as b-lactoglobulin. Fortunately, the same study cited above from the Journal of Agricultural and Food Chemistry has measured precisely this. 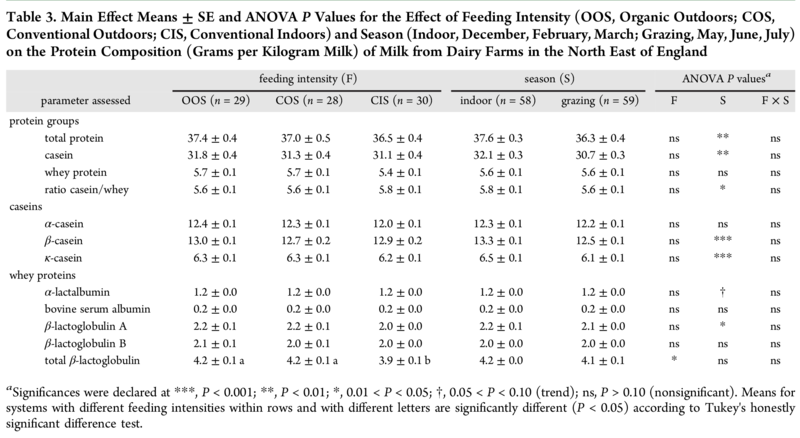 The table below is taken from the study and lists the effect of three different types of milk production systems that differ according to their feeding intensity. From the information above it is evident that there is very little meaningful difference in the level of key whey and casein protein fractions. For example, when compared with indoor milking systems, outdoor milking systems (OOS & COS) resulted in a slightly higher (i.e. 8%) concentration of total b-lactoglobulin. What’s more, there was little difference in total protein yield or the ratio between casein and whey proteins when comparing dairy farms that employ different feeding intensities. The bottom line in the argument for and against the use of grass fed whey protein is supplement transparency, traceability and disclosure. If a supplement is looking to make a claim that their product is superior because it contains whey protein produced exclusively from grass fed cows, it should be able to reflect this in some aspect of the product, namely higher levels of a certain protein fraction, fatty acid, or lower levels of environmental toxins such as volatile solvents. The greater the level of transparency, traceability and disclosure from the given supplement manufacturer, the more likely there is to be a tangeable benefit from the particular feeding system and method used to produce the milk. Stergiadis S, et al. Effect of feeding intensity and milking system on nutritionally relevant milk components in dairy farming systems in the North East of England. Journal of Agricultural and Food Chemistry. 2012;60:7270-7281. Dewhurst RJ, et al. Increasing the concentrations of beneficial polyunsaturated fatty acids in milk produced by dairy cows in high-forage systems. Anim Feed Sci Technol. 2006;131:168-206. Butler G, et al. Fat composition of organic and conventional retail milk in northeast England. J Dairy Sci. 2011;94:24-36. Butler G, et al. Fatty acid and fat-soluble antioxidant concentrations in milk from high- and low-input conventional and organic systems: seasonal variation. J Sci Food Agric. 2008;88:1431-1441. Slots T, et al. Potential to differentiate milk composition by different feeding strategies. J Dairy Sci. 2009;92:2057-2066. Engel E, et al. Relevance of isotopic and molecular biomarkers for the authentication of milk according to production zone and type of feeding of the cow. Journal of Agricultural and Food Chemistry. 2007;55(22):9099–9108. Vlaeminck B, et al. Factors affecting odd- and branched-chain fatty acids in milk: a review. Anim Feed Sci Technol. 2006;131:389–417. Wilking L, et al. Impact of milking frequencies on the level of free fatty acids in milk, fat globule size, and fatty acid composition. J Dairy Sci. 2006;89(3):1004-1009. Klei L, et al. Influence of milking three times a day on milk quality. J Dairy Sci. 1997;80:427-436. Perez-Ramirez E, et al. Herbage intake and behavioural adaptation of grazing dairy cows by restricting time at pasture under two feeding regimes. Animal. 2008;2:1384–1392.